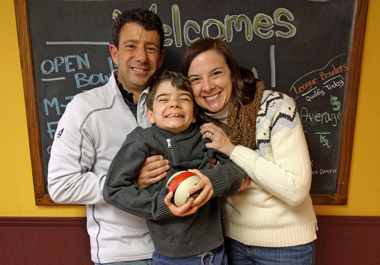 When Jonah Kirschner was 2 years old, his parents, David and Erin, noticed their little boy was no longer acquiring new words or using the ones he already knew. Today, 8-year-old Jonah happily chatters and sings in the background as his father recounts the journey the family began with a diagnosis at Rady Children’s Hospital-San Diego and continued at the Hospital’s Autism Discovery Institute, where Jonah received services. Erin hopes their donations will help other families to know that there are programs and people who can help them. Soon after his diagnosis, Jonah’s speech therapist recommended that the family participate in the Stepping Stones program at Rady Children’s for children with an autism spectrum disorder. The program uses a structured play curriculum designed to enhance communication and interaction between parent and child, and between children. Rady Children’s also referred the family to the San Diego Regional Center, a nonprofit agency that serves people with developmental disabilities. The center provided a therapist who conducted home visits for more than a year. Jonah attended a Del Mar Union School District preschool for children with special needs, while also meeting weekly with an occupational therapist at Rady Children’s Solana Beach center. Jonah and the therapist worked on developing his strength and spacial awareness, expanding his tolerance for handling various textures and managing his daily routines. UPDATE: Today, Jonah is 9 years old, progressing well and attending school on a modified schedule with his typically developing peers. His parents have been so pleased with his progress and their experience with the hospital, that they continue to be enthusiastic supporters of Rady Children's programs. Donate now and help kids like Jonah!